With what is happening in the APC at present, it is obvious that the same bees that swarm around the PDP and stung it in 2015 have bitten APC today. On June 12, 2015, I published an article with the above headline, wherein I talked about the controversy that engulfed the nation over the emergence of Senator Bukola Saraki and Hon. Yakubu Dogara as Senate President and Speaker of the House of Representatives, respectively, against the expectation of the ruling All Progressives Congress (APC). At that time, the APC had made so much fuss about the election of Saraki and Dogara as leaders of the National Assembly, calling it all sorts of names. In the article, I had stated that what happened in 2015 at the National Assembly was a repeat of an event in June 2011 at the House of Representatives, when Hon. Aminu Tambuwal, now Sokoto State governor, was elected Speaker against the desire of the Peoples Democratic Party (PDP). With what is happening in the APC at present, it is obvious that the same bees that not only swarm around the PDP but also stung it in 2015 have bitten APC today. Like it happened to PDP in 2015, APC is witnessing defections of some of its top-notch members to the PDP. Already, Saraki, Tambuwal, Benue State governor, Samuel Ortom, and Kwara State governor, Ahmed Abdulfatah, have dumped the APC for the PDP. Also, 14 APC senators, including ex-Kano State governor, Rabiu Kwankwaso, and Senator Dino Melaye have defected from APC to the PDP. Likewise, 18 Sokoto State lawmakers and 23 Kwara State lawmakers, APC national publicity secretary, Bolaji Abdullahi, former Nigerian ambassador to South Africa, Alhaji Ahmed Ibeto, and others have quit APC for the PDP. History is, indeed, repeating itself. With the defections, PDP, the gainer, is grinning from ear to ear, just like APC, now the loser, did in 2015. It appears that nemesis has caught up with the APC as some of what it gained in 2015 are being lost presently. The APC is receiving today the measure it gave the PDP in 2015. This is why it is amusing that, after Saraki defected to PDP, APC is shouting from the rooftops that he must resign his position as Senate President, since he has left the party on whose platform he emerged. But APC failed to acknowledge that, although Saraki was an APC senator, the party never made him Senate President. Senators did, at a time the party opposed it, and, therefore, would be the ones to decide whether Saraki stays or leaves. Besides, Nigerians are not suffering amnesia. They remember what happened before. When Tambuwal dumped the PDP for APC in 2015, he remained Speaker. APC, at that time supported it. Saraki has dumped APC and the party wants him to relinquish his position as Senate President. Talk of double standard! “It’s no exaggeration to say that one of the problems of Nigeria is that history keeps repeating itself. Funny enough, it’s bad history that is always repeated. Successive Nigerian leaders, in government and corporate institutions, have always failed to learn from the mistakes of their predecessors and others and, therefore, do the same wrong thing. And this has left the country in a vicious circle of mistakes, some of which are avoidable, if lessons are learnt. As it is with individuals, so it is with institutions also. “Four years ago, the House of Representatives was embroiled in crisis over the selection of a Speaker. At that time, the political party in power, the Peoples Democratic Party (PDP), whose member was to occupy the position of Speaker, had played god. The PDP had decreed that the position of Speaker had been zoned to the South West. It also endorsed Hon. Mulikat Akande to occupy the position. Despite this PDP directive, then Hon. Aminu Tambuwal, now Governor of Sokoto State, with the backing of the majority of the lawmakers, joined the race and chose Hon. Emeka Ihedioha, as his sparring partner or running mate. In the contest, Hon. Akande stood no chance. Tambuwal was voted as Speaker and Ihedioha, Deputy Speaker. And the House of Representatives, on that score, affirmed its independence, telling the PDP and the Executive/Presidency, which supported the zoning and imposition of a candidate for Speaker, to go to hell. “In that speakership saga of 2011, the opposition party served as the arrowhead in the rebellion against the PDP and the Presidency. The opposition provided the guillotine with which the head of PDP was chopped off. This demystification and disgrace of the PDP at the House of Representatives did serve as the beginning of the end of the political party. With that defeat, PDP exposed itself as vulnerable and not invincible. With that, politicians knew that the PDP could be taken on and defeated. And they did take the PDP on, which, in one way or another, contributed to the party’s loss of power last March. 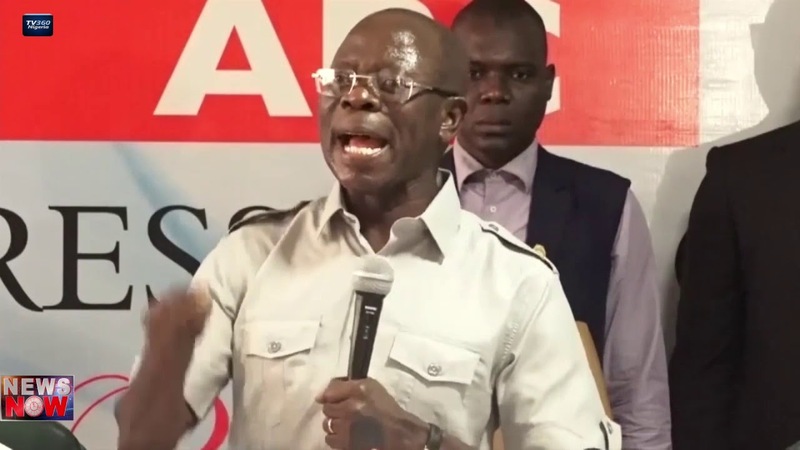 “Now, four years after, who could have believed that the All Progressives Congress (APC), which came to power on the mantra of “change,” could make the same mistake? Repeating history, the APC did choose those who would be Senate President and Speaker of the House of Representatives. And it did order its members in the National Assembly to vote for them. The irony is that an APC, which criticised the PDP in 2011 for trying to impose a leader on the House of Representatives, is the one that chose Alhaji Ahmed Lawan and Hon. Femi Gbajabiamila as the preferred candidates for Senate President and Speaker, House of Representatives respectively. Like the PDP in 2011, the APC played god, ordering its members in the National Assembly to line behind those it had so anointed and imposed on them. But just as it happened four years ago, the National Assembly members said no to such imposition of candidates. “Senator Bukola Saraki, from Kwara State, got elected as Senate President, while Hon. Yakubu Dogara, from Bauchi State, emerged as Speaker, House of Representatives. And the surprise of the century is that the distinguished Senator Ike Ekweremadu, a member of the PDP, was elected as Deputy Senate President, in a Senate that has APC members as the majority. “What I said in 2011, when members of the House of Representatives ignored the orders of PDP and elected Tambuwal as Speaker, is what I will repeat here, in 2015: Members of the National Assembly were right in rejecting imposition of leadership. What happened at the National Assembly is a step in the right direction. By rejecting and resisting imposition of candidates, federal lawmakers have revealed their determination to be independent. They have passed a vote of no confidence in APC. They have demonstrated that they, as legislators, are ready to function in their offices, independent of external interference, in the spirit of separation of power.